Has the message of the Free Speech Movement been lost? Editors’ Note: The interview has been edited for length and clarity. In the fall of 1964, the UC Berkeley administration ramped up already severe restrictions on the right to free speech on campus. 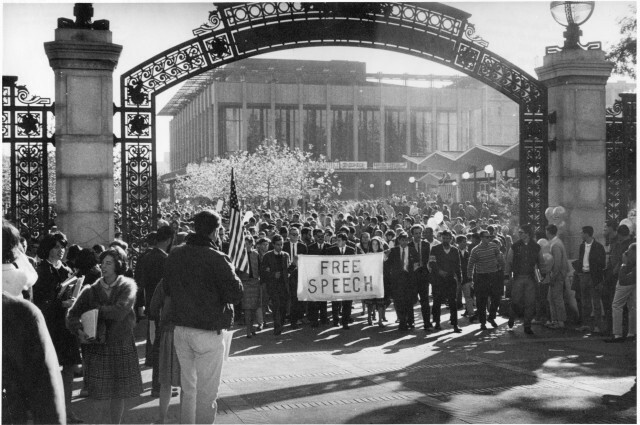 UC Berkeley students participated in the Free Speech Movement to defeat the restrictions. The Free Speech Movement began with thousands of students surrounding a police car on Sproul Plaza for 32 hours to prevent a civil rights activist from being arrested. A subsequent mass occupation of Sproul Hall and campuswide student strike demanded that charges be dropped against students for violating the administration’s restrictions on free speech. Sam Farber is a professor emeritus of political science at the City University of New York. He was a graduate student in the department of sociology at UC Berkeley from 1963 to 1969, where he obtained his doctorate. He was active in the Free Speech Movement and the UC Berkeley chapter of the Congress of Racial Equality. He, along with Joel Geier and Hal Draper, founded the Independent Socialist Club in 1964, which played a key role in organizing the Free Speech Movement. Geier will be a guest speaker at a Free Speech Movement teach-in March 14 at 7 p.m. in Valley Life Sciences Building room 2050. The teach-in is open to the public and admission is free. Mukund Rathi: How did the Free Speech Movement begin and what was the context for it? What impact did it have? Sam Farber: What I think is contrary to what some other people have tried to argue, (is) … that the FSM was about education overall. And there may have been some element of that, but nothing compared to the importance of the Civil Rights Movement. What happened is that the Berkeley campus had become an organizing space for the Civil Rights Movement, and in particular the activities that were carried on in San Francisco, Oakland and Berkeley (against the discriminatory hiring practices of major businesses). The Oakland Tribune was a very reactionary newspaper led by former Sen. William Knowland, who was on the right wing of the Republican Party. The Tribune began to attack the activists but also to put pressure on the campus administration to stop the movement. Students would leaflet for these protests at the intersection of Bancroft and Telegraph, which was thought to be city property, and thus not subject to university restrictions on political speech. The university pulled out some documentation showing that in fact it was on university property, and therefore people could not put tables there. The student activists couldn’t meet on campus — this was a legacy of McCarthyism. It was almost impossible to have a political meeting on campus because you had to have a professor chairing the meeting to ensure that it was conducted “respectfully” and all that nonsense. Therefore all the political meetings were held at Stiles Hall, which was a block away — it was private, not property of the university. The university now tried to exclude people from setting tables at that corner, and that was the spark. And I should say that there was an underlying conflagration … but nonetheless that was the spark that led to a gigantic movement against the authorities and eventually to an incredible victory of the students. … They won the right to have public political meetings all over campus. You would just fill out a form saying we want to have a meeting in Wheeler or some other building and the university gave you a confirmation that a room was available at such-and-such time and that was it. … It was a big bonanza for the organizing of the Civil Rights Movement — and the anti-Vietnam war movement was about to get big shortly after the FSM. In fact, many of the activists in the FSM became anti-war activists in the following semester, in the spring of ‘65. So the campus was incredibly radicalized by the experience of the Free Speech Movement, and I know from personal experience that it radicalized hundreds of students at Berkeley. MR: One of the high points and most important victories of the Free Speech Movement was the occupation of Sproul Hall and the student strike. Can you comment on that? SF: That was highly significant. There were over 800 people arrested at Sproul Hall. I myself could not be arrested because I only had a green card at the time. But there were many things I could and did do. We had a telephone chain, and I lived, like, seven blocks from campus. At about four o’clock in the morning, I got a call and immediately, I got dressed and brought a camera because I thought that would be helpful. I started picketing outside. … (The arrests) started in the early hours of the morning — 4 or 5 o’clock — and went on until about 5 or 6 in the afternoon that day. The sheriff’s department was there from Alameda County; there were people that the Alameda County borrowed from other parts of the state. It was just an unbelievable military display of force, … It certainly set the record then, of the number of people arrested in one particular incident. MR: One of the antagonists in the FSM was UC President Clark Kerr, who wrote a lot about the university and what its role should be. What do you recall about that and what role did that play in the FSM? SF: Clark Kerr had this technocratic, pro-business point of view. Before being UC president, he had been the director of the Institute of Industrial Relations at Berkeley. He was an industrial sociologist. … Hal Draper wrote a pamphlet that turned out to be quite influential about “The Mind of Clark Kerr,” where he describes the technocratic and antidemocratic politics of Kerr. This was also shown in the way Kerr tried to contain, manipulate and, when necessary, repress the movement. MR: So, our current chancellor, Carol Christ, said in one of her opening statements for the new school year that the Free Speech Movement was about students uniting on the left and right to win free speech rights. Is that accurate? SF: That is technically accurate, but a gross, gross overstatement, to the level of caricature, of the weight of the right within the FSM. There was a tiny group of maybe 10 people that had a Republican club, and they joined in as part of the federation of groups. But to say that it was a coalition with them is like a coalition between 10 people and 2,000 — I mean, that’s laughable. MR: So, let’s take a quick break and talk about today. The right wing invited Milo Yiannopoulos and Ann Coulter to UC Berkeley’s campus. When students protested and shut down Milo’s event, the right wing said the Free Speech Movement is dead and that they were the new free speech movement. What do you think about that — about the right claiming the mantle of free speech? SF: I think that’s an example of hypocritical manipulation if there is one. I wrote a piece in Jacobin and made, in broad terms, a distinction between when the right wing tries to intimidate people (physically and otherwise), and examples like Charles Murray, who is a propagandist for the right wing but not involved in coercion or violent activity. I honestly think that it was a mistake to try to prevent Murray from speaking. But I think it’s completely appropriate to respond as our brothers and sisters did in Charlottesville, Virginia, to try to stop by any means necessary — as Malcolm X would say — people who came with guns and sticks and tried to intimidate and beat us up. That is the only response that is warranted in that situation where we are not in the field on ideas — we are in the field of intimidation, and therefore we have to respond appropriately to that intimidation. MR: One of the refrains we hear today is that to fight for free speech, we need to engage in open dialogue and come to the table with people with different political opinions. Was the Free Speech Movement won through that kind of dialogue, or what did it take? SF: Well within the movement there was certainly dialogue and discussion about what the main issues were, (such as between higher education overall or the Civil Rights Movement specifically). But I don’t think there was any dialogue with the forces of law and order who were trying to clobber us into submission and stop the movement. … I don’t think the question is (whether) we should have a dialogue with the right. I think we should have an argument with the right. Whether the use of force is justified or not depends on the setting. As I said, in Virginia, the use of force was 120 percent not only justified but required. I think the posing of this in terms of “dialogue” is profoundly mistaken because it assumes that people like Murray are well-intentioned people, trying to reach the truth and share some basic point of view with us. We don’t share anything at all with them. MR: What was the role of the Independent Socialist Club in the FSM? SF: We played a very important role, and the ideological weight of Hal Draper was very significant. He put forward the analysis of “The Mind of Clark Kerr.” The speech that Mario Savio gave, about being cogs in a machine and so on, was in my view pretty much a popularization and very effective presentation of the analysis that Draper made. MR: Joel Geier, who helped found the ISC and the Berkeley chapter of the Congress of Racial Equality, is giving a talk on the FSM on March 14. Do you recommend that students attend? SF: Oh, absolutely. Joel did not have the limitations I had because of my noncitizenship. He was also more experienced than I was and more of a leader. I think that his contribution will be far more substantial and important than what I’m saying now. MR: Well, I think this is a very substantial contribution! Thank you for taking the time to talk. Casie Stone and Andrea Steves contributed to transcription.